My Masta.. Great Sephiroth .. i'm sorry if my limited skill has botherin' this great Chara.!! the pic. was from MT's affiliates.. !! ..btw.. i never usin' tutorial.. yeah ..thats why my wallie suckz..! 'n thats the reason why it takes long time 4 me in makin' wallie..!! yeah..whatever!! Wow, that looks really great! I like the dark colors and I like Sephiroth *. * He's sooo cool. Dark bg, but suit Sephy's character. Good work on those icy effect on the left side of Sephy, conceal more of his cold personality. Text is good, especially with the ring-smoke effect around it. Very nice wallpaper. I like the effects on the background. I like also the icy effect on the character. Yet another great wall from ryannzha! Well done! Keep up the good work! 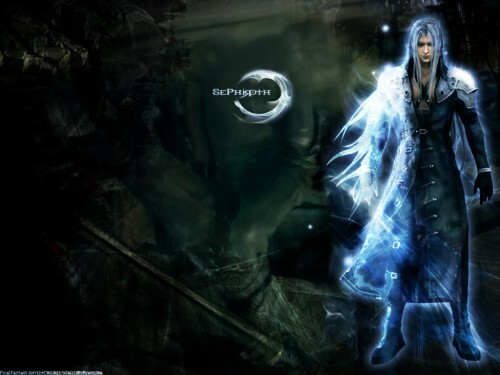 Dude that is so awesome sephiroth looks so cool ther with the blue and dark it looks good. nice one...like the backround and the effects on his arms...the font is prtty cool too...good job! I do like the half transparent effect, it give the feel of ghost, nice one, the sephiroth do looks more cool in this state. sephiroth rocks. this puts my sephiroth wall to shame. Wow, very awesome wall... great job... sephiroth looks killer in that. That is by far the best work that I have seen for Final Fantasy period... keep up the excelent work.. I expect Final Fantasy Advent Children dvd!!! Good job on touching up the left side of sephiroth. I couldn't get mine to work cause it was pretty hard. Good work. keep up and show us more of Sephiroths great appearences...!!! Look cool and I like the background too !! Match well with Sephiroth !!! Cool and great work !! Thank for sharing !! The dark background gives a Great look in the wall! Awesome wally, great work !